As spring break comes to a close, I'm already thinking about places I'd like to take the family on Memorial Day. Last year on the holiday weekend, we were invited to SeaWorld San Diego to experience the newest show Blue Horizons. We had such a great time, that the kids are still talking about it. Which is saying a lot, because they are teenagers and they are VERY hard to impress. As you all know I follow the SeaWorld Parks's Blog. (I have the link on my most read blogs list down to your right) So when I saw that they are giving the Shamu Show (my favorite show of the park) a makeover, debuting in SoCal on Memorial Day weekend, I decided exactly where I want to be this year. Here's a little bit about the new show. It called ONE OCEAN, it's replacing the current show BELIEVE. But the new twist, (an educational message) and hope from SeaWorld is that this show inspires us as viewers to make a difference in this world. 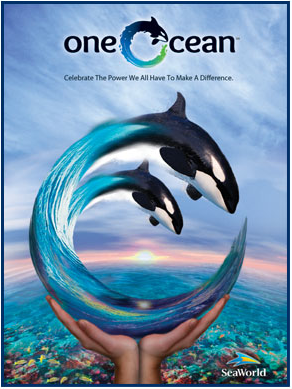 Jim Atchison, president and chief executive officer of SeaWorld Parks & Entertainment says "One Ocean" brings to life SeaWorld's mission in a powerful way. By educating & inspiring you to celebrate, connect and care for the world we share." I am also looking forward to seeing the new ways in which trainers interact with these magnificent and beautiful creatures. As we all know they've had some really tough times lately. Here are some photos that I took last year of the Shamu Show Believe, the last shot is of the night time spectacular Shamu Rocks... I cannot wait to go back and "SEA" all of the new things they have going on! For more information you can follow SeaWorld Parks on TWITTER, & like them on FACEBOOK. Absolutely magnificent pics!!! I too LOVE SEA WORLD!!!! Thank God we have it!!! San Diego has sooooooooooooooooooo much and for that I am grateful!! !